After a long winter’s nap (otherwise known as fighting the flu and other assorted viruses for the last four to six weeks), I’m back blogging! And what a time to return. Today is Edible Joy’s 2nd birthday! AND this is my 101st post and also my first post of 2010. Saturday afternoon programming on Seattle public radio station KUOW is pretty random, which I think is pretty wonderful. This past Saturday, I listened to stories about photographer Jini Dellaccio, the book Stitches and a man recounting life growing up with his blind father. I also heard a story about a subject very near and dear to my heart: doughnuts. KUOW reporter Megan Sukys talked with City Arts writer Tracy Schneider about Seattle’s world of doughnuts and how their arrival in America is tied to Lent. 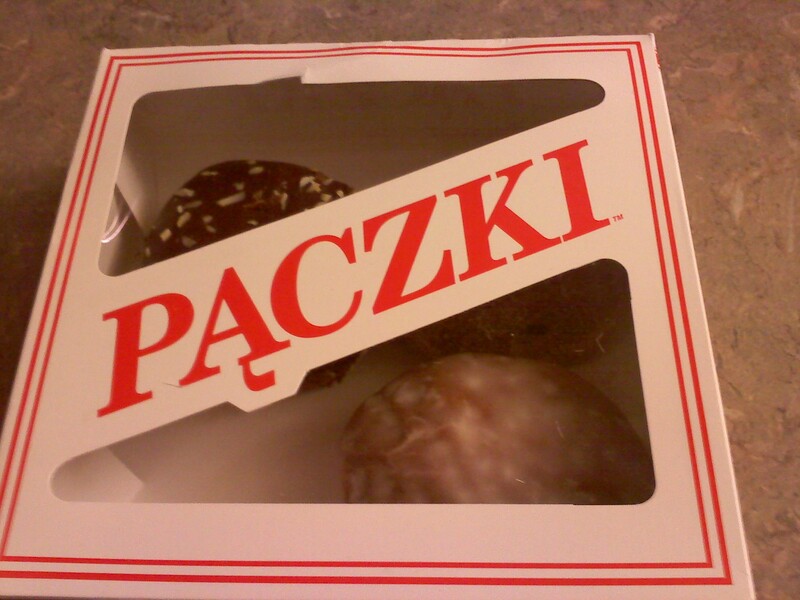 In addition to the food history lesson (that surely Alton Brown would have enjoyed), I was introduced to a doughnut I had never known about–the Polish paczki (pronounced “poonch-key”). Schneider described paczki as “bismarcks on steroids” and said that they had an especially rich dough with more eggs and more sugar. Sold! 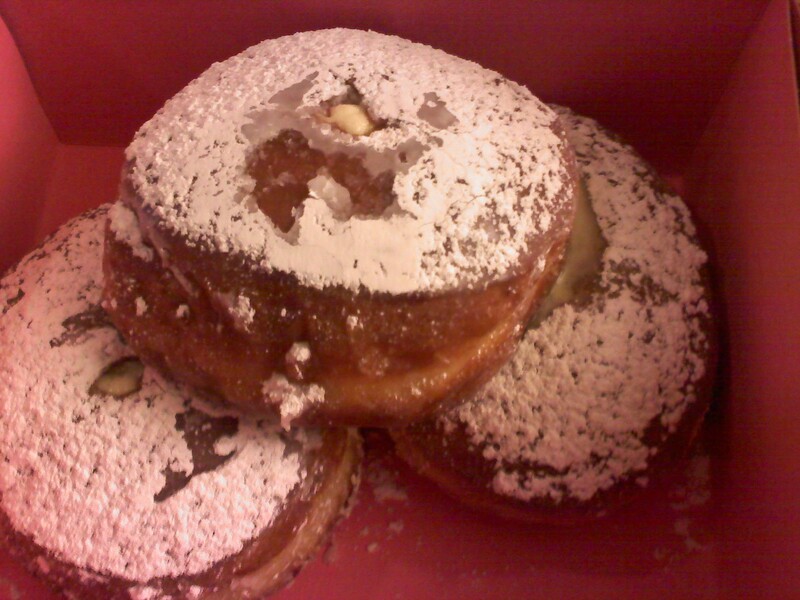 The next morning, I headed out to Bakery Nouveau and the West Seattle Metropolitan Market to get some paczki. It was the kind of rainy, sleepy Sunday morning that makes Seattle feel like a small, provincial town. I loved driving down the hushed streets and running such a trivial errand. I picked up some cream packzi at Bakery Nouveau (photo at the top of the post) and chocolate, lemon and raspberry varieties at Metropolitan Market. The Bakery Nouveau paczki were studded with candied orange peel, which was tangy and delicious and paired well with the cream filling. And while I enjoyed the filling, I was disappointed with how thin it was. When I cut the doughnut in half, it just ran out onto the plate. It was a little like cutting into a poached egg. The paczki from Metropolitan Market had sturdier fillings, and I liked the lemon one the best. Paczki are only available for two weeks out of the year and will be gracing Seattle with their doughy goodness until Fat Tuesday, February 16.